This may not go according to plan though because I have a whole pile of books to distract me. This entry was posted in Book Reviews and tagged book, meme. That book pile can certainly be distracting! I try to stay clear of my TBR shelf unless it’s time to pick a new book. Hot Button looks like a fun book. I’m reading Brave New World by Aldous Huxley and Forever in Blue by Ann Brashares. LOL – I know all about being distracted by “other” books. So many books out there, so many shiny covers, so many plots to discover…. That are some nice looking mysteries. Good luck with solving the crimes 😉 Have a great week. I see you like cozy mysteries too! 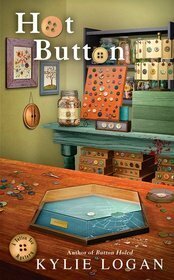 I have a column at Fresh FIction.com that features each month’s cozy mysteries – check it out if you’d like! I do like cozies. I will check out the site, thanks.